Eddie Futch, who finally retired from boxing in 1998 at age 87, is not only one of the greatest trainers in boxing, but one of the sport's true gentlemen. Born in Hillsboro, Mississippi in 1911, Futch moved to Detroit as a child. It is there that he excelled in athletics, including basketball and boxing. In 1932, Futch won the Detroit Athletic Association lightweight championship and a year later the Detroit Golden Gloves. At the Brewster Recreation Center gym, Futch became friends with the local light heavyweight sensation named Joe Louis. The future all-time great often asked Futch to spar with him, saying, "If I can hit you, I know I'm sharp." A heart murmur prevented Futch from turning pro, but he soon began training local amateurs and later pro fighters. Futch, like fellow Hall of Fame trainer, Ray Arcel, left the sport for more than a decade. 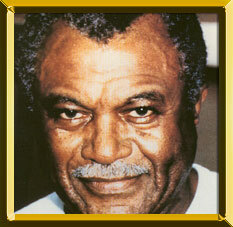 But he returned in the 1950s and guided Don Jordan to the welterweight championship in 1958. He eventually worked with champions Bob Foster, Joe Frazier, Ken Norton, Alexis Arguello, Marlon Starling, Virgil Hill, Wayne McCullough, Michael Spinks, Larry Holmes and Riddick Bowe. Futch maybe be best known for developing the strategy that caused Muhammad Ali his first two defeats. He trained both Frazier and Norton for the wins over Ali. He has received numerous awards from the Boxing Writers Association of America. Among them are: Manager of the Year (1975) and Long and Meritorious Service (1982).